The Georgia rental agreements are to be written between landlord and tenant for the use of property in exchange for payment. The terms of each document must be pursuant to the laws in the State with Residential Title 44 > Chapter 7. Each party should review the contract and when it has been agreed upon it should be signed with copies distributed to lessee and lessor. Rental Application – Before authorizing a lease the potential tenant’s credentials should be verified by collecting their employment, credit, and any other related information. Association of Realtors Agreement – Provided by the Georgia Association of Realtors for residential tenancies. Commercial Lease Agreement – For any type of business related space including retail, office, industrial, and storage. Lease with Option to Purchase (Lease to Own) – A typical fixed term contract that includes a provision to allow for the sale of the property. Month to Month Lease Agreement – Known as a ‘tenancy at will’ and the agreement has no end date but may be cancelled with a termination letter. Room Rental (Roommate) Agreement – To come to terms with others that share the same living space within a residence. Standard Residential Lease Agreement – Fixed term version for residential tenancies provided by the Department of Community Affairs (DCA). Sublease Agreement – Between the lessee and a sub-lessee for the use of property until the end of the lessee’s rental term or any other period as agreed by the parties. Typically the landlord’s consent is required. 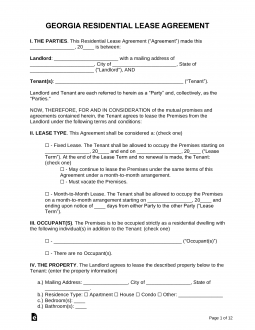 Termination Lease Letter (§ 44-7-7) – Known as a ‘tenancy at will’ in that the agreement has no end date but the landlord must provide at least sixty (60) days’ notice to cancel and thirty (30) days if the tenant decides to terminate. Identification (§ 44-7-3) – Landlord must make information about all managers/individuals/agents allowed to be on the property aware to the tenant. Inspection Form (Title 44, Chapter 7, Article 2) – Upon the landlord’s acceptance of the Security Deposit they must give a list of all prior damage on the premises. Lead Paint – Per federal law if the residential dwelling was built prior to 1978 this document must be attached to the rental contract. Previous Tenants (§ 44-1-16) – If asked by the new lessee, the landlord must disclose the following if the former tenant: was infected by a virus, died (accidentally, naturally, or by suicide), and/or homicide or felony on the property. Unlike most States, in Georgia there is no requirement for the landlord to give notice before entering the tenant’s property. Although it is highly recommended that the landlord always give reasonable notice. Returning (§ 44-7-34) – Landlord must give the deposit back to the tenant within one (1) month of the termination date.